When using 1Password (and 1PWX), it would be great if it would also (optionally) include a special character. Most every password policy out there requires the usual mix of characters and types. The password generator doesn't have enough options to hit those variables. What I would like: The options "Add a special character" and "Where? Start or End" on the password generation screen. 1PW would then pick a random special character and insert it. If I select "End", it would place the special character and the end of the password string. So there are two ways to generate a password in 1Password X. One is the inline menu which has no control. I'm not sure what the parameters used there are but I believe it includes symbols. If you click the 1Password button in the browser toolbar though you'll get a slightly different menu and the Password Generator there allows for enabling or disabling symbols. I believe we do want to improve the Password Generator but I'm not sure what the plans are except that we can't have it where it's a barrage of options. It needs to be kept relatively simple because the more you allow control the weaker the generated passwords become. Having 1Password add a symbol to the end won't help with the password strength at all if that can be predicted and would only be about appeasing a requirement. Generated passwords are inherently more stronger the less we restrict them. 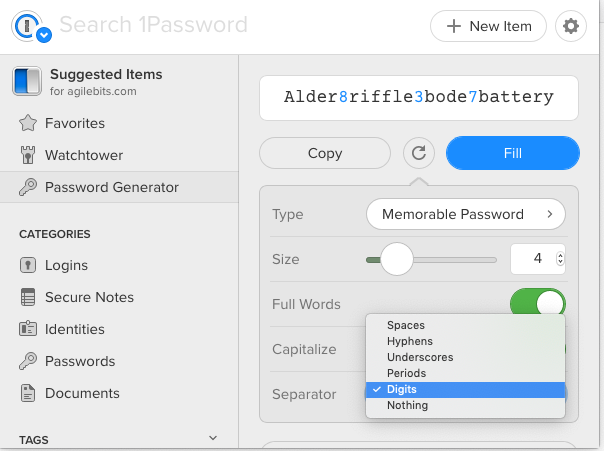 For the really demanding sites, all of the Password Generators; 1Password for Mac, for Windows and 1Password X allow the editing of the password before filling. I would recommend using this as little as possible though to retain as much of the randomisation as possible. 1PWX doesn't let you edit the password once it is created, only copy or regenerate. I understand the need to maintain complexity and randomness, and not wanting to have 15 options for creation, but it would increase the utility of the Memorable Password option if it could include a special character. It already does alphanumeric just fine. Adding a special doesn't necessarilly help, but when the website demands it, I end up copying the 1PW-generated password manually and adding a special, then hope that 1PW and the website work together to prompt me to save the password. So I'm definitely going to file a bug report for the lack of editing. I can click on the field and move the text cursor around. Not allowing me to inline edit the password before filling at that point seems very wrong and doesn't match what others experience with either 1Password for Mac or Windows. Your screenshot did highlight something I'd overlooked. You have it set on Memorable Password at the moment which doesn't use symbols. If you change the type instead to Random Password one of the options that can be toggled is the use of symbols. You may find the random password option is better for the majority of your uses. Could that help a bit? The way I use this is I will generate a memorable password that has transformable letters, then adjust it leet-wise (1337-wise). For exampe, "alpha-beta" might be "@[email protected]@". 1 wish 1PW offered this. Thanks for letting us know, @BC_EZ. We'll take your feedback on board when considering improvements to the password generator.